The playlist will keep all the tracks to be played, but XMPlay also has the ability to index all your music in its Library. To play files, you have to add them to the playlist first. You can add tracks to the library by choosing Add to library from the Track context menu, by dropping them on the library, by using the Add file button at the top of the Library tab of the Info Window, or by using monitored directories. XMPlay doesn't do anything to the files themselves when you add them to the library, it just reads and saves all tag information. Click the Save button to export all entries of the library into a playlist file. The information about the entries are shown in different colums. Left-click a column header to sort the tracks using that column. You can sort by multiple fields by left-clicking the column headers in reverse sorting order. 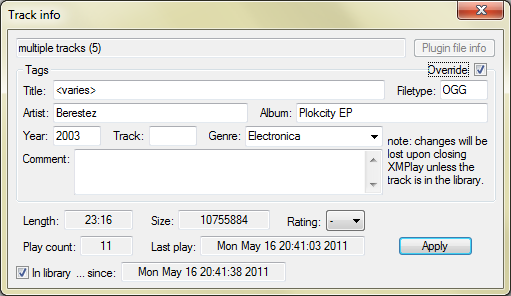 For example, click track, then album and then artist to sort by artist, then by album and finally by track. Right-click a column header to select which columns to show. The File column shows the filename, or the full path and filename if you tick Full path/file. The Size column shows the file size in bytes, or in something more easily readable if you tick Abbreviate filesize. The Play count column shows the total number of times you've played a track, or the number of times you've played a track divided by the number of months the track is in the library if you tick Average play count/month. The field on the top right usually shows the total number of tracks in the library, but it'll also show the search terms and the number of hits if you've used Find. 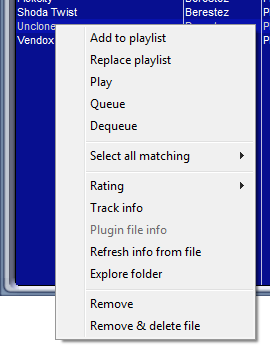 The Track context menu is mainly the same as the one in the playlist, but there are some small differences. Add to playlist will add the currently selected file(s) to the bottom of the playlist, while Replace playlist will clear the current playlist and put the selected tracks into it. Play will select the file in the playlist (or add it if it's not there yet) and play it directly. If you've selected multiple files, XMPlay will add all of them and start playing the first one. Queue selects or adds the file as well, but adds it to the queue rather than playing it. Dequeue removes the file from the queue, or does nothing if the file is not in the queue. Select all matching allows you to extend the current selection based on track information; you can choose from Title, Artist, Album, Year, Track, Genre, Comment, Type and Folder. Finally, Track info allows you to view and override tags for all selected files. The changes you make here are applied to all entries currently selected, which allows for mass-adjusting of the tags.